Barinder Saluja, Chandigarh,Sept. 14 : Sh. 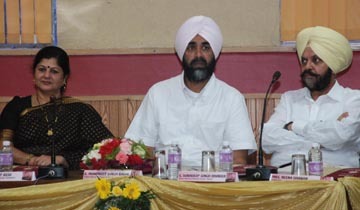 Manpreet Singh Badal, Cabinet Minister for Finance and Planning, Govt. of Punjab urged the students to realize their potential and contribute to the development of the country while inaugurating a one day UGC Sponsored National Seminar on “Youth Subculture” organized by the Sociology Department of MCM DAV College for Women. The seminar was organized to revisit the dynamic and evolving youth subcultures and their impact on the wider scope of culture and society. Sh. Manpreet Singh Badal, was the Chief Guest for the event. Sh. Badal inaugurated the event and congratulated MCM as the ‘flagbearer of innovative education in the region’. Sh. Sukhdeep Singh Bhinder, Senior Additional Advocate General, Punjab was the Guest of Honour at the event. He applauded the efforts of the college in focusing on issues related with the youth and their affiliations. The keynote address was delivered by Dr. S. L. Sharma, Chairperson of the Task Group on Urban Development, Punjab Governance Reforms Commission. Dr. Sharma elaborated on the concept of Youth Subcultures and explained the various facets of these subcultures in the context of social studies. The seminar went through two academic sessions in which stalwarts and eminent scholars in the field from all over the country presented their papers on globally viable issues such as ‘Youth Empowerment’, ‘Consumer Culture Among Youth’, ‘Youth and Politics’ and ‘Changing Parental Practices and Urban Youth’. The academic sessions were followed by a Panel Discussion in which the topic was comprehensively discussed. The Principal of the college, Dr. Puneet Bedi reminded the youth that they have to first fulfill their duty towards their country than expect in return from it. Dr. Bedi iterated that youth culture and subcultures have an undeniable effect on the course of societal development and expressed the viability of discussing such a pertinent subject.